Come to Mathews and see the farm and explore this vital ecosystem. A typical tour begins on one of the most beautiful creeks in Mathews County. From the private dock we will observe the upweller where the 2mm seed oysters are growing. 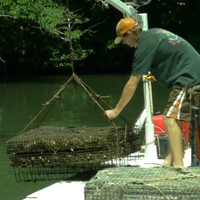 The oyster barge will also be explained and demonstrated. You can even dress up and take some pictures if you want. From there, we'll venture by boat to see a cage where the oysters mature then cruise the Piankatank and learn about the process that brings you the Chapel Creek Oyster. We are too. We would love to customize your tour to observe some of our avian friends on the Piankatank. Inclement weather or high winds may cause us to postpone our excursion. We'll notify if there are any weather issues. Dress appropriately - Wear layers, a hat and sunscreen. Bring your own picnic and beverages if you would like.